The Hodograph is a vector diagram showing how velocity changes with position or time. It was made popular by William Rowan Hamilton who, in 1847, gave an account of it in the Proceedings of the Royal Irish Academy. Hodographs are valuable in fluid dynamics, astronomy and meteorology. Hodograph plot of wind vectors at five heights in the troposphere. This indicates vertical wind shear and also horizontal temperature gradients. Since the wind veers with height between V2 and V3, it is blowing warmer air north-eastwards to a colder region (image source: NOAA). The idea of a hodograph is very simple. Velocity vectors at different times or places are all plotted with a common origin, or emanating from a single point. Then their varying directions and magnitudes make a pattern that can give dynamical information in a visually clear way. Sometimes the velocity arrows themselves are omitted and only their end-points are plotted. Thus the hodograph is the locus of the arrow-heads as they vary with time or space. Hamilton gave the origin of the word hodograph, from ‘оδος, a way and γραφω, to write. 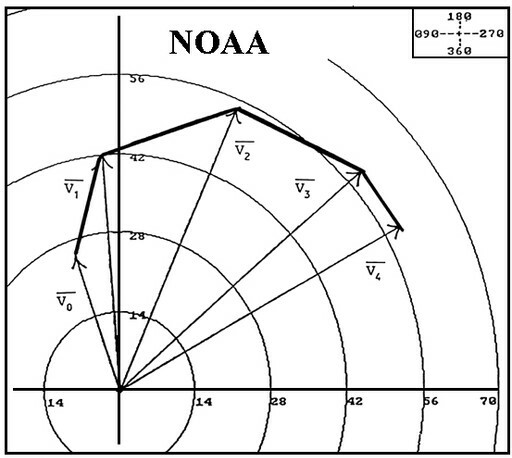 In meteorology, hodographs are useful for plotting wind soundings. The wind arrows at different levels are plotted on a polar diagram, so that wind shear, or wind change with height, is clearly shown (see figure above). Dynamically, vertical wind shear is linked to horizontal temperature gradients; this rule, known as the thermal wind, is a consequence of the Earth’s rotation: Just as the wind blows with the low pressure to the left, the wind-shear vector has the low temperature to its left. So, the hodograph gives information about the location of warm and cold air and about temperature advection. Another application of hodographs is to the winds in the atmospheric boundary layer. Near the ground the wind is weak and it strengthens and veers with height. On a voyage in the Fram, explorer Fridtjof Nansen had observed that the drift of icebergs was at an angle of 20°-40° to the right of the wind. He discussed this with Vilhelm Bjerknes, the leading meteorologist, who asked his student, Vagn Walfrid Ekman, to investigate it. Ekman solved the problem in short order, and published his theory of the Ekman spiral, which explains the phenomenon in terms of the balance between frictional effects and the Coriolis force. The Ekman spiral is the hodograph of the wind as it varies from the surface to the top of the boundary layer. Ekman spiral of winds from zero at the Earth’s surface to its “geostrophic” value, here (u, v) = (10, 0), at the top of the boundary layer. Hodographs first proved useful in astronomy. If we plot the vectors from the Sun to a planet as it revolves, the locus of their tips is an ellipse. The movement from one arrow to the next gives the velocity. Hamilton showed that, for a planet in a Kepler orbit, the hodograph of the velocity is a circle. This surprising result is easily shown, starting from the polar equation for an ellipse, the orbit of the planet. Hamilton showed it in purely geometric terms (although a lack of illustrations in his paper makes the arguments less than easy to follow). The figure below shows an elliptical Kepler orbit (left) and the corresponding circular hodograph (right). 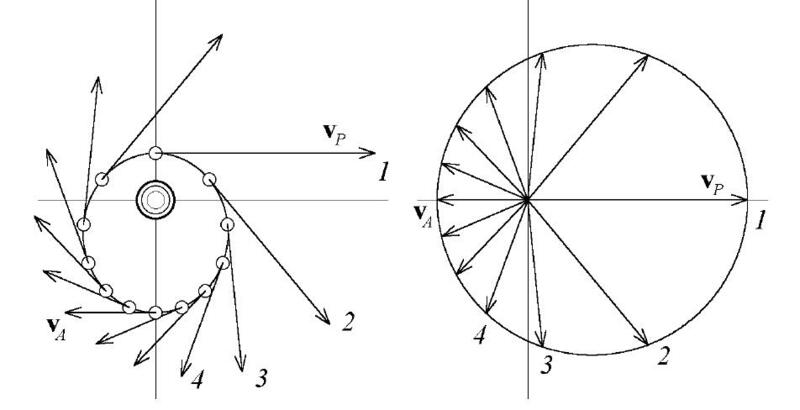 the velocity vector in velocity space (right) [from Butikov, 2000]. Butikov, Eugene I, 2000: The velocity hodograph for an arbitrary Keplerian motion. Eur. J. Phys. 21 (2000) 1–10. Hamilton, William R, 1847: “The Hodograph, or a New Method of Expressing in Symbolic Language the Newtonian Law of Attraction”, Proc. Royal Irish Acad., 3 (1847), pp. 344–353.